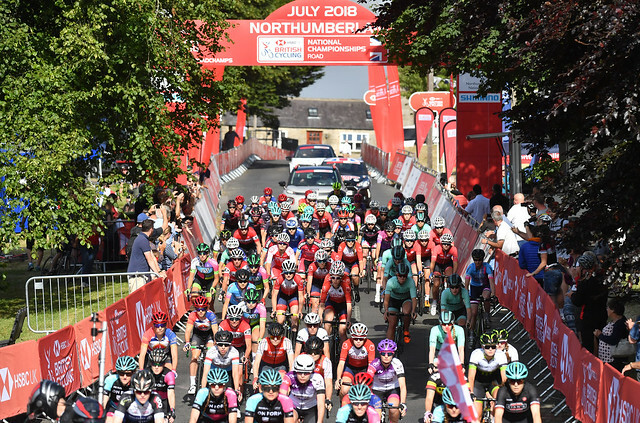 Jessica Roberts and Connor Swift produced stunning performances on the roads of Stamfordham as they stormed to victory in the women's and men's road races at the HSBC UK | National Road Championships. Roberts attacked late on to finish just 1.5 seconds ahead of Olympic gold medallist Dani Rowe as 20-year-old Ellie Dickinson completed the medal positions in Northumberland. In the men’s race, 22-year-old Connor Swift blew away the field in the 13km to seal a famous victory for Madison Genesis. Adam Blythe was closest to chasing down the youngster but Swift held off the charge comfortably with Team Sky’s Owain Doull in third. There was plenty of elite talent in the 103-rider field and there was no shortage of drama throughout the 106.2km race. Elinor Barker endured a nightmare start as she was caught up in a crash that also featured Lizzy Banks, leaving the 23-year-old a minute behind the peloton. Shortly after Dani Christmas made a solo attack and opened up a gap of 27 seconds heading into the second lap, with Alice Cobb and Annabel Fisher in second and third. The Bizkaia Durango-Euskadi Murias rider continued to lead throughout the second lap with Storey Racing’s Melissa Lowther and Anna Christian, of Trek-Drops, in hot pursuit. But Christmas would be overtaken by Nikki Juniper, Natalie Grinczer, Hannah Payton and Christian who asserted themselves and consolidated an eight-second lead. The enthralling race continued to take another twist as the peloton caught the leading pack ahead of the final gruelling climb of Ryals. But Roberts and Lowther opened up a 35-second gap heading into the 1.5km ascent with Sophie Wright closing in. Lowther then made a late attack with 3km to go as she pulled out an 11-second lead but that wasn’t enough as Roberts overtook her in the final kilometre. With the peloton closing in, Roberts was able to hold-off the charging Rowe to clinch gold with Dickinson just edging out Lowther for third spot. "I'm just so happy - I can't believe it," said Team Breeze's Roberts. "I started crying as I crossed the finish line because I was just completely overwhelmed." Another strong field took to the streets of Northumberland for the men’s race including Mark Cavendish and Ed Clancy. In a tightly fought opening lap, a group of 17 riders including Owain Doull, Ben Swift, his cousin Connor and Adam Blythe, broke free from the peloton. The lead group maintained a gap of more than two minutes from chasers Andy Tennant and Tom Moses with the peloton more than three minutes adrift in the third lap. With 50km to go Ian Stannard, Mark Donovan and Jake Stewart opted to close the gap to just 45 seconds from the leading group. But the trio couldn’t get near the leaders and with 13km remaining Connor Swift opened up a gap of nine seconds. Blythe, who won the National Championships road race in 2016, attempted to close that margin but could not get close to Swift who blew away the field to clinch a famous title. An emotional Swift said: “It’s a dream come true. To win a National Championship, it’s such great prize. “I felt so good on that last lap and I could tell others were struggling. There was nothing to lose. I did a big risk and it paid off. To have a National Championships as a first win of the year for the team is amazing. “That breakaway had been riding all day long and I knew everyone was tired towards the end. I was sitting on adrenaline. I knew I had to go as hard as I possibly good.